Amazon.com description: Product Description: An Essay on the Development of Christian Doctrine, reprinted from the 1878 edition, âis rightly regarded as one of the most seminal theological works ever to be written,â states Ian Ker in his foreword to this sixth edition. 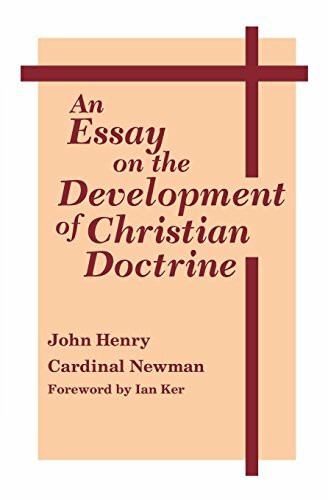 âIt remains,â Ker continues, "the classic text for the theology of the development of doctrine, a branch of theology which has become especially important in the ecumenical era.â John Henry Cardinal Newman begins the Essay by defining how true developments in doctrine occur. He then delivers a sweeping consideration of the growth of doctrine in the Catholic Church from the time of the Apostles to his own era. He demonstrates that the basic âruleâ under which Christianity proceeded through the centuries is to be found in the principle of development, and he emphasizes that throughout the entire life of the Church this principle has been in effect and safeguards the faith from any corruption.